The Roland HPi-7 is a fantastic example of the type of Roland Digitals which Atlanta musicians have been enjoying for years. It allows the enjoyment and fun of creating music in your own home to even higher levels. 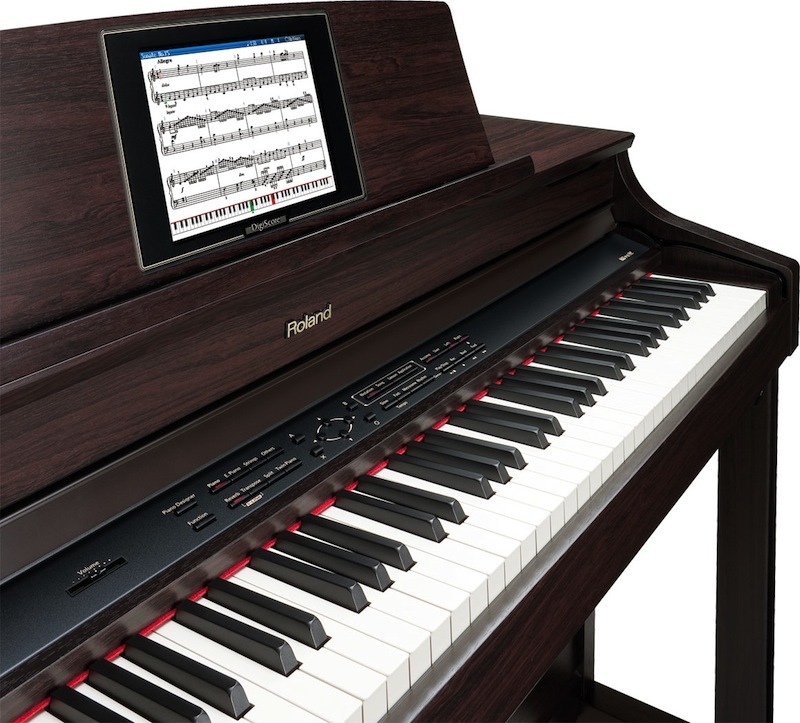 It incorporates the technological advancements of a color LCD screen, interactive visual lessons and great connectivity to provide an instrument which will encourage and reward anyone seeking to learn the piano regardless of their age and experience. 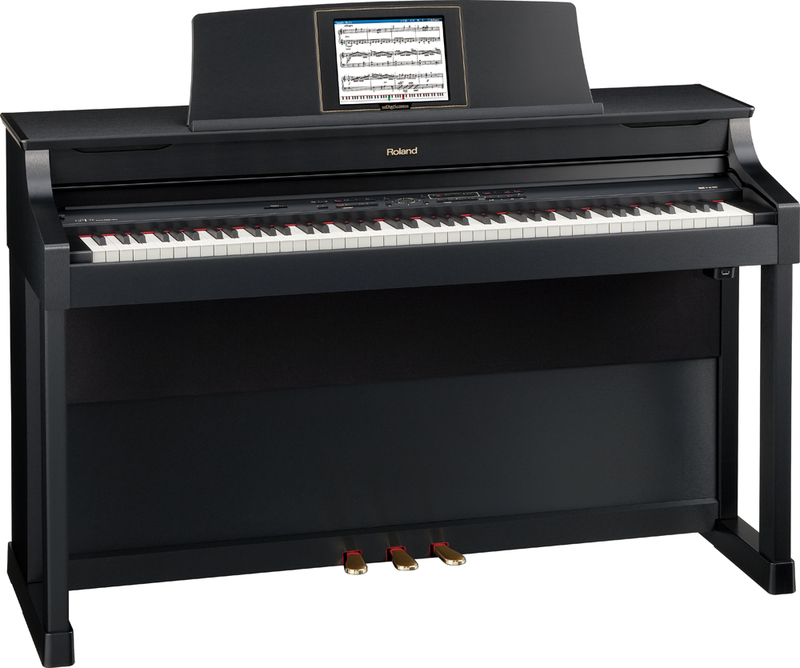 The Roland HPi-7 digital piano features an easy to read, wide color LCD display screen which enhances the unique Roland Digiscore notation and makes the interactive visual lessons easier to follow. The lessons provide a readily available music tutor with three programs for practice allowing music exploration for pupils of any age. The 128-voice polyphony feature together with the innovative key off resonance of tones combines to produce an authentic acoustic sound. This unique sound benefits from subtle tonal changes which occur when the keys become released. The HPi-7 also benefits from the library of Roland stereo sampled sounds of the latest pianos. This creates a realistic and authentic piano samples which creates a rich resonance of sound. There are a number of nuances of acoustic pianos which have been cleverly emulated and integrated into the software of the HPi-7 including damper resonance, hammer response, string resonance and velocity sensitivity of the keys. Roland has filled it to the brim with innovations including the Digiscore screen which has been built into the music rest for optimum viewing. This feature allows the display of notations for all internal songs, recorded performances, midi files and downloads. There is a “bouncing ball” cue which helps the musician keep time as you are playing, while the pages are “turned” visually on the screen. This makes it an excellent teaching piano. There is a split screen facility which allows for a metronome to be set while looking at playback notations, or show the lyrics and notations simultaneously. Connectivity is also impressive on the HPi-7. The ports for midi and USB together with two headphone jacks have been conveniently located for easy access on the front panel of the instrument. This makes it easy to play without the need for excessively long cords and cables. The editing functions allow finger numbering to be added directly to the notations. It will also allow changes to song length and editing of individual notes within the music files. This can be easily accomplished while looking at the screen display of the music. You can even save notations to your music files as a bitmap, which can be transferred to your PC for sharing or printing. Roland’s HPi-7 provides visual lessons which can act as a personal music tutor. The interactive lessons feature three courses which include independent music exercises and songs with variable difficulty levels together with check, practice and review screens. This provides an excellent basis for learning and can supplement formal lessons, or teach on an independent basis. If you are looking for digital Roland pianos, Atlanta musicians should seriously consider the HPi-7. It provides the optimum balance of authentic acoustic sound with all the innovations of an interactive digital piano. Right now we have one that just came into our used stock. See the Used Pianos. There has always been a recognized trinity between the mind, the body, and the therapeutic qualities of music. And the piano, specifically, has been a long-recognized source of remedy for those seeking escape and creative expression. But recent years have also offered a wealth of scientific studies that demonstrate our instincts have always been correct: playing the piano offers proven benefits—from physical and intellectual to social and emotional—to people of all ages. Who knew? Those piano lessons we took when we were young offered specific physical benefits to our developing bodies. And piano lessons and practice can also, it turns out, improve the physical health of adults and the elderly. Dr. Arthur Harvey, retired professor at University of Hawaii at Manoa, published a study through the American Music Conference that details the vast physiologic benefits generated by regular musical practice. One obvious boon of regular piano playing, Harvey found, is the sharpening of fine motor skills in children. But playing music, according to Harvey’s research, also “activates the cerebellum and therefore may aid stroke victims in regaining language capabilities.” Additional research revealed that group keyboard lessons given to older Americans had a significant effect on increasing levels of human growth hormone (HGH), which is implicated in slowing such aging phenomena as osteoporosis, energy levels, wrinkling, sexual function, muscle mass, and aches and pains. The physical benefits of piano playing are even more far reaching. Mitchell Gaynor M.D., in his book Sounds of Healing, demonstrates that music has therapeutic physical effects including reduced anxiety, heart and respiratory rates; reduced cardiac complications; lowered blood pressure; and increased immune responses. In addition to the proven body benefits of regular play, piano practice can also boost cognitive and intellectual abilities. Playing piano, in other words, makes us smarter. Research through the years has demonstrated that musical training taps into similar areas of brain function as those used in spatial intelligence and even math. In fact, kids who continue their playing through their teenage years average about 100 points higher on the SAT. In 1994, research revealed, undergraduates who majored in music had the highest acceptance rate into medical school, at 66%. In a study conducted by E. Glenn Schellenberg of the University of Toronto at Mississauga in 2011, researchers split 132 first-graders into four separate groups for after-school activities. One group was given singing lessons, one was given drama lessons, another piano lessons, and the last was offered no after-school instruction. All of the students’ IQ’s were evaluated at the end of the year. Those who participated in the piano lessons saw an IQ increase of 7 points, while the other groups saw an increase of 4.25 at most. The researchers concluded that the fact that piano education requires one to be focused for long periods of times contributes to the greater IQ gains in the piano-playing group. As if the physical and cognitive benefits of regular piano playing were not enough, studies also show that time at the keyboard offers emotional advantages, as well. In fact, research reveals that those who are involved in creating music on a regular basis experience less anxiety, loneliness and depression. Barry Bittman, MD, of the Body-Mind Wellness Center in Meadville, Pennsylvania, created a study to gauge stress levels among 32 volunteers. The volunteers were put through a stress-inducing activity—attempting to assemble a difficult puzzle while incentivized by a monetary prize—and then were told to “relax” afterward using a variety of different methods, including reading magazines and playing keyboards. The volunteers also gave blood during the study, and the blood was tested for the activity of 45 stress-related genes. In the group that played keyboard to relax, the results showed a significantly higher reversal in the markers for stress-related genes than in the other groups. When anyone thinks of a piano, the name Steinway is always the first to come to mind. The brand name of Steinway & Sons is synonymous with beautiful timbre and fantastic quality. Steinway has been crafting pianos since 1853, when master cabinet craftsman Henry E Steinway produced his first piano, built in his own home. By the time he had formally created the company and established Steinway & Sons, Henry had built over four hundred pianos. The first officially produced by Steinway & Sons sold to a family in New York for the sum of five hundred dollars and was identified as number 483. For the next three decades, Henry together with his sons revolutionized the development of the modern piano. They patented over one hundred inventions which were based on scientific developments and research which emerged including theories on acoustics by renowned physicists. These amazing designs were coupled with superb craftsmanship to create a nationally recognized quality of piano creation. While many people think Steinway piano ranges are limited to large grand pianos, their hand-craftsmanship and quality have actually been used to produce a number of upright piano models including the Steinway 1098. Steinway & Sons pride themselves on using the same craftsmen, techniques and processes which they use on a typical grand piano to produce a superior quality upright piano. 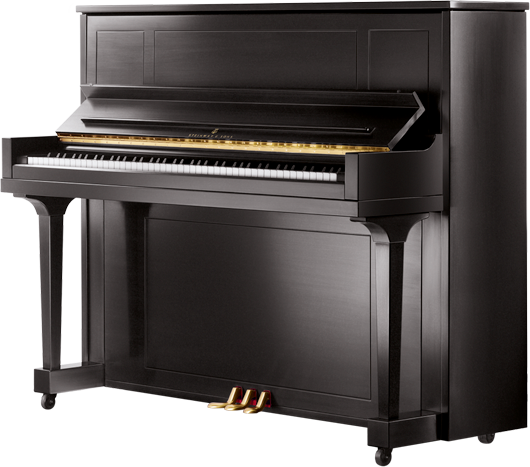 While many of the world’s most talented and accomplished pianists from all genres of music prefer a Steinway piano, the upright models such as the 1098 remain more practical for many musicians. The 1098 allows for much of the quality and tone of a larger grand piano without needing an excessive amount of space. Steinway uprights are still made using over one hundred patented processes and features to ensure a superior quality of sound. The frame is constructed from solid birch and maple to provide a great deal of stability and vertical strength. The braces are taped to ensure that the back frame remains straight and allows for consistent tuning. The soundboard is constructed in a similar manor to that of a violin to allow an even and free response across the whole scale. The design and shape allows a great freedom of movement which creates a rich and longer tonal response. The keys are individually weighted and are created to be stain resistant and chip proof to ensure the lasting beauty and functionality of the piano. The key bed is hand milled to promote a snug fit and a solid mounting which allows uncompromising and prolonged and precise action. The Steinway 1098 provides a clarity of sound which is unrivalled by any other upright brand of piano. It makes a beautiful feature in any room and generates a satisfaction and love of playing in the most untrained novice to the most experienced aficionado. With a little care and attention, it can provide wonderful sounds and timbre of music for generations. Through Steinway Piano Galleries of Atlanta you can order a new one or perhaps find a nice pre-owned Steinway Piano. Is Steinway The Best Piano? After surfing the Internet, hearing directly from confused customers, future Steinway piano buyers, music educators and piano technicians, I want to take this opportunity to address false accusations by non-Steinway dealers and rebuilders. They take it upon themselves to post false, undocumented information to the public via Internet web sites or verbal communication about the Steinway piano. I am John Simon, owner of Steinway Piano Gallery Tucson. I have been an authorized Steinway dealer for over 28 years. Our family owned business was started in 1932 by my father, the late Edward Simon. I was awarded the Steinway dealership in 1983. I am knowledgeable in the history of the Steinway piano and how it is designed and built. Consequently, I know all 12,116 parts that it takes to make a Steinway including how the Steinway piano has evolved since the first Steinway in 1853. I qualify as an expert in Steinway product because of the extensive training that Steinway and Sons has provided me over the years. With over 50 visits to the factory I have personally witnessed the building of a Steinway piano from the beginning process to the end. This qualifies me to write this article in support of Steinway & Sons, a company that has produced the finest pianos in the world since 1853 and is featured every year in the magazine The Best of the Best. Since I cannot address every negative comment about Steinway, I will address the most misleading articles about the Steinway piano. In addition I am able to support my comments with written articles or quotes by the people who build the Steinway and design the Steinway including the head concert technician. These false claims produced by non-Steinway dealers and rebuilders are normally supported by the verbage “experts say” or “experts agree”. But the important question is, who are these “experts” and do they have the credentials to support their testimony about Steinway pianos? We certainly know they are not Steinway piano people. implies that the new, or today’s Steinway is not as good as the older Steinways. 3. 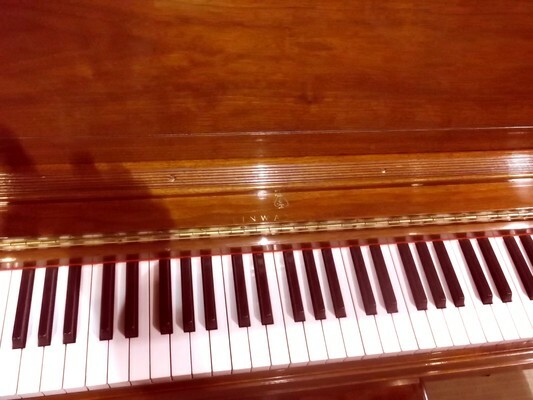 A claim that their rebuilt Steinway piano uses genuine Steinway parts. Pearl River in China to build Steinway pianos. 5. The Hamburg Steinway is better than the New York built Steinway. Today 95% of the performing artists choose – of their own volition – to perform on Steinway pianos. Steinway has never paid a performing artist to play their piano. This is by choice. A quote from Franz Mohr, “As you know I was the Chief-Concert Technician at Steinway for over 30 years and let me tell you that as a musician and technician I have a real love affair with the Steinway piano. It is the best piano ever conceived in the human mind. In all of my travels and personal relationships with the artists, I do not know of one artist today that would prefer an older Steinway over today’s Steinway”. The famed Steinway Concert piano room in the basement of Steinway Hall, where the artist can try out and pick the Steinway they want to perform on, has no Steinway older than 15 years. There are 50 Steinways in that basement. Today there are 125 “All Steinway Schools”. Not one of these schools has purchased the older Steinways. All 125 schools purchased the current model Steinway for their institution. Fact is that the Steinway of today is so much better there is no room for comparison at any point. The Steinway piano of the present is at the apex of its greatness. In power, purity and the beauty of tone it far excels the models of previous years. An important development of tone volume or tone power has been achieved within recent years. The action of the instrument is proportionately quicker and more responsive. The repeating quality is nearly electric in effect. Never before was the mechanical work so fine. The materials used were gathered from the four corners of the earth whatever they may cost in endeavor or money. Every part of a Steinway is a known quantity. Every Steinway is made in the Steinway factory. There zealous of family traditions and universal reputation assures a continuous improvement of their product rather than deterioration. Yesterday’s artists demanded yesterday’s Steinways. Today artists demand today’s Steinways. In 1972 with an aging ownership and no heirs to the business Henry and John Steinway (I knew both personally) decided in the best interests of the business that it was time to sell. The company was sold to an owner that would guarantee the continued success and financial support of the business. This clause was inserted to protect the Steinway product from becoming the normal mass produced “production piano”. It assures that every Steinway piano would be designed and built by Steinway people only, no exceptions. The process of building the piano would continue as usual. Non-Steinway dealers and rebuilders often claim that they use genuine Steinway parts. A minority of these dealers and rebuilders use only genuine Steinway parts. A majority use generic parts. If the soundboard has been replaced and the piano was not sent to Steinway to be replaced then the soundboard is not a Steinway soundboard. Steinway will not sell their soundboards to anyone. Most rebuilt pianos on the west coast market have been sent to Mexico where the labor is cheap and generic parts are being used. If you purchase a rebuilt Steinway ask the dealer to provide you an itemized list of what was done to the piano and a Certificate of Authenticity. All reputable dealers should offer you one without your asking. This will guarantee 100% refund of your investment if a generic part is found in the piano. A Steinway that has generic parts is not a Steinway! In some of these articles it is claimed that the current owners of Steinway have contracted with Kawai (Japan) and Pearl River (China) to build their pianos. This would make one believe that the Steinway piano is being built in other countries. The Steinway & Sons piano is only built in two countries, in the USA since 1853 and in Germany since 1873. They have never been built anywhere else. The claims that Hamburg Steinways are better than New York Steinways tells me one thing, that these non- Steinway dealers have not been well informed. To set the record straight the New York Steinway has always been, and is today, the overwhelming choice of artists performing in America. This fact is verified by Steinway Hall on West 57th Street in New York City. There the legendary basement houses over 50 Steinway concert grands including both the New York and the Hamburg Steinways. Artists throughout the world visit this basement on a daily basis to select the Steinway they perform on for upcoming performances. Records prove that the New York Steinway is the overwhelming choice. In fact, approximately 95% of the artists that perform in the United States choose to perform on the New York Steinway. This data was confirmed by the Concert and Artist Department located at Steinway Hall New York. Michael Mohr, Director Manufacturing/Assembly for Steinway & Sons in New York states, “the choice between the American built Steinway and the German built Steinway is more of a territorial one.” Mr. Mohr says the Hamburg Steinways are more often tuned between the range of A-442 to A-444 to appeal to the European taste for a bright sound. The combination of harder hammers and the tuning pitch create a brighter sounding piano. This is what most Europeans are comfortable and familiar with. The New York Steinway has always used softer hammers and been tuned at A-440 giving it a fuller sound and creating more depth in color, that American audiences and many performing artists prefer. This difference in sound is really the main difference between the pianos, as both are constructed from the same materials using the same patents and techniques that have been handed down and implemented on every Steinway-whether built in Hamburg or New York-for generations. The statement that one piano is better than the other is false. It comes down to a matter of sound preference. If you would prefer to purchase the German Steinway today you would have to pay $40,000.00 more to cover the import duties. This is the one reason these non- Steinway piano dealers tell you the German Steinway is better. It is to inflate the Steinway price to a range that they know you will not want to spend, making their mass-produced pianos, by comparison, more reasonable. There are certainly many non-Steinway dealers and rebuilders that are honest and will present the correct facts. They will also have in writing materials that support what they tell you. Be sure to ask them. My point is… does a non-Steinway dealer know more about the Steinway piano and its history than a Steinway trained, informed and authorized Steinway dealer? And I guess if they are willing to go that far they are willing to tell you anything. Please contact me if you have any questions about this response and feel free to ask to view any of the support materials referenced in writing this article.